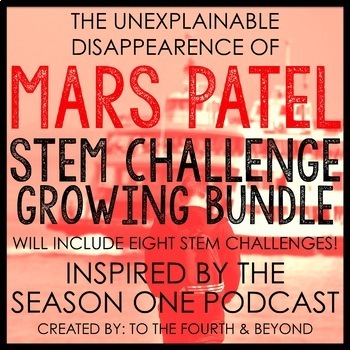 These Mars Patel Themed STEM challenges are inspired by "The Unexplainable Disappearance of Mars Patel" Season 1 Podcast! These challenges were created to be easy to implement! Included in each resource you will find detailed pages to help you plan and prep for each STEM challenge. Question: Can you create a catapult that can stop Mr. billionaire genius Oliver Pruitt’s hologram? 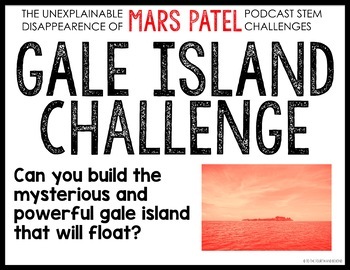 Question: Can you build the mysterious and powerful Gale Island that will float? Question: Can you create a temporary shelter that will keep Mars and his friends safe on Gale Island? Question: Can you create a ferry boat that will keep your passengers dry and safe for their journey to Gale Island? Question: Can you create the ledge that kept Mars and his friends safe from the cameras inside Pruitt Prep? What will students do in these challenges? In this challenge, students will build a catapult that can propel a marshmallow (or your choice of object) at least four feet with accuracy to hit a target. 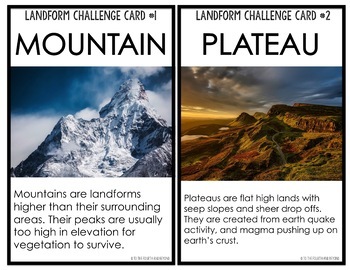 In this challenge, students will build a floating island that must also have two models of landforms on it (landform challenge cards included!) Students' islands must float for 1 minute in a tub of calm water. 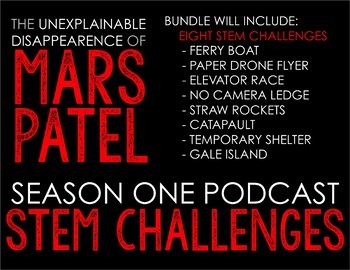 In this challenge, students will build a temporary shelter that must stand on it's own and be large enough to fit Mars and his friends paper cut-outs. In this challenge, students will build a ferry boat that must float for 1 minute and survive waves for 1 minute while also keeping Mars and his friends paper cut-outs safe and dry. In this challenge, students will build a ledge that must hold 3 pounds and keep Mars & his friends safely hidden from the cameras inside Pruitt Prep. Single classroom use only. Please purchase additional licenses for use in more than one classroom.